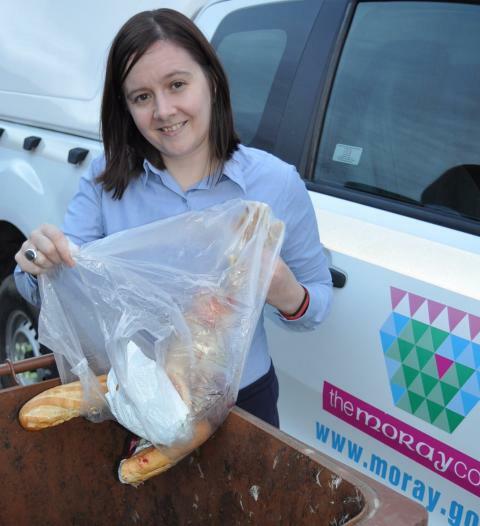 A festive appeal has been issued to households in Moray to recycle any Christmas leftovers as part of a drive to vastly reduce the amount of food waste being dumped at the council’s Dallachy landfill site. It is estimated that around 5000 tonnes of food waste from Moray homes finds its way into landfill every year when it could – and should – have gone for recycling. That alone costs council taxpayers in Moray around £400,000 a year in landfill tax to the Scottish Government. Now staff in the council’s waste management section are giving a timely reminder to coincide with the festive period that the remains of the Christmas turkey – along with other leftovers from the dinner table – should be deposited in the brown waste bin for recycling. “Households throw away a huge amount of food and drink every year, especially over Christmas and New Year,” said recycling officer Fiona Burnett (pictured). “More than half of the materials which go to landfill at Dallachy are capable of being recycled - and a large proportion of that is food waste. “We throw away more food and drink each year than we do packaging and much of it ends up in landfill because people put it in their green bin instead of where it should go, which is their brown bin. For those who do not have a garden or a standard 240 litre brown bin, Moray Council can provide smaller plastic containers where waste food can be deposited. All manner of food waste can be placed in the brown bin for recycling, including fruit and veg, bread, pasta, rice, cheese, eggs, yoghurt, raw and cooked meat and fish, tea bags and even pet food. However, care should be taken to remove all packaging which may be suitable for recycling elsewhere.